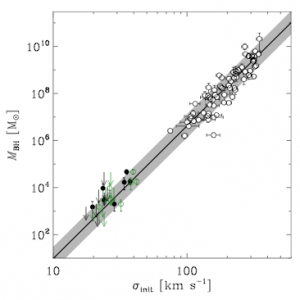 Did massive black holes in globular clusters initially satisfy galactic scaling relations? The masses of supermassive black holes (SMBHs, MBH = 106-1011 Msun) in the centres of galaxies are related to the host stellar spheroid mass and velocity dispersion. A key question is how these relations originate, and over which range of black hole masses they hold. It has been speculated that intermediate-mass black holes (IMBHs, MBH = 102-105 Msun) could play a fundamental role in the growth of SMBHs. A handful of IMBHs have recently been detected in Galactic globular clusters (GCs), but their masses are inconsistent with the galactic scaling relations of SMBHs. In this Letter, we derive the initial properties of the GCs using a standard analytical evolutionary model, of which the free parameters are fixed by independent constraints. We find that the observed IMBH masses initially followed the galactic SMBH scaling relations and subsequently moved off these relations due to the dynamical evolution of their host GCs. This work is concluded with a brief discussion of the uncertainties and the implications of our results for the possible universality of massive black hole growth.